The plants commonly called Calla Lilies are members of the genus Zantedeschia. They are herbaceous flowering plants native to Africa, ranging from South Africa north to Malawi. Although not considered true Lilies, the Calla Lily is an extraordinary flower. This beautiful plant, available in a multitude of colors, grows from rhizomes and is ideal for use in beds and borders. You can also grow them in containers, either outdoors or in a sunny window as houseplants. 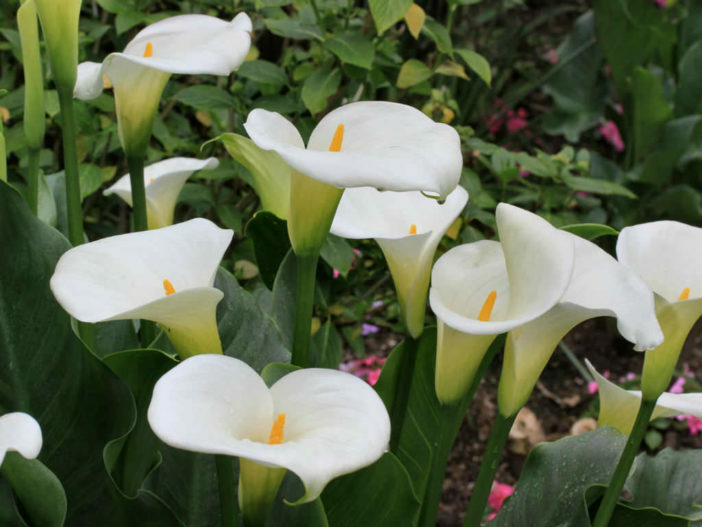 Here are a few tips on growing Calla Lilies that will make them sparkle in your yard. It is easy to grow Calla Lilies. These plants do not generally require too much attention. Proper planting and location are about the only important things to consider when growing Calla Lilies. Care of them requires that they be planted in loose, well-drained soil. They prefer to be located in full sun or partial shade in warmer climates. Plants are typically planted in the spring. However, wait until the threat of frost has passed and the soil has warmed sufficiently before planting. They should be planted rather deep, about 4 inches (10 cm) for greater results, and spaced approximately a foot apart. Once planted, the area should be watered well. Calla Lilies enjoy being kept moist and will also benefit from a monthly dose of fertilizer throughout the growing season. As with planting, there’s not too much required for the care of Calla Lilies other than keeping them watered and fertilized. An adequate layer of mulch around the plants will help keep the area moist and free of weeds. They require a dormant period once flowering has ceased. During this time, you should refrain from watering as much to allow the plant to die back. If you grow Calla Lilies in containers, cease watering and move the plant to a dark area once the foliage has faded. Regular watering can resume within two to three months. Although they can remain in the ground year round in warmer climates, they should be lifted and stored in cooler areas. Dig up the rhizomes in autumn, usually after the first frost, and shake off any soil. Allow them to dry out for a few days before storing the rhizomes for winter. Calla Lilies should be stored in peat moss and located in a cool, dry area, preferably dark, until warmer temperatures return in spring. Likewise, you can choose to start your plants indoors during late winter and transplant them outside in spring. They can also be divided when lifted or during their dormancy period. Growing Calla Lilies is easy and care is minimal at best. Choosing to grow them in the garden or as houseplants is a great way to add color to any area. These tips on growing Calla Lilies will help you enjoy these lovely flowers even more.